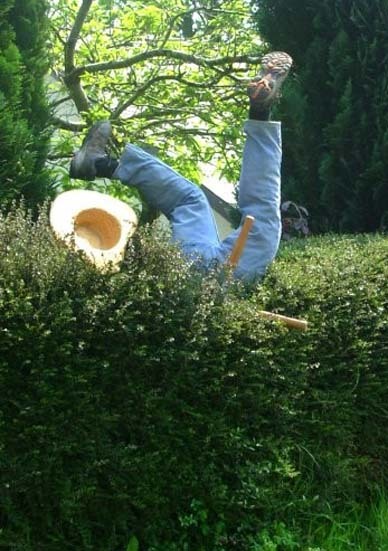 Here is a clever scarecrow idea from John Kerry: Scarecrow in a Manhole! 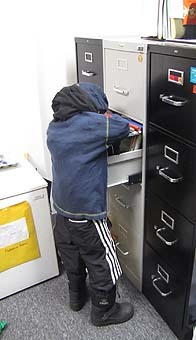 John says, 'There is no hole - just a painted wooden frame around his waist'! This display was in the Village Competition at Bratton Clovelly, Devon, UK. 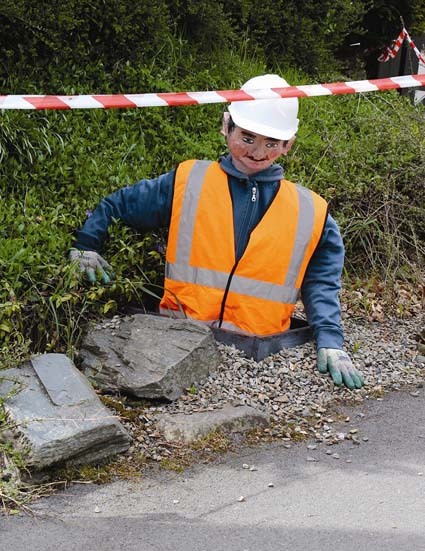 John Kerry also sent in this wonderful Gardener Scarecrow from the Bratton Clovelly competition in UK. John says, 'He had passing drivers stopping to help him'!! Here is a terrific scarecrow display by Haydn and Karen Williams and boys from Farlam Parish in UK. 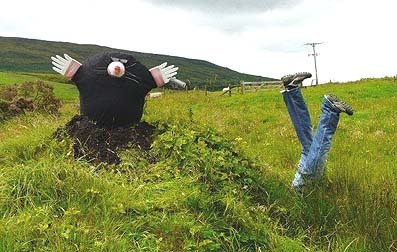 It seems that there is a bit of a problem with moles in Farlam, captured beautifully by this funny display! Photograph courtesy of Hugh Beesely. 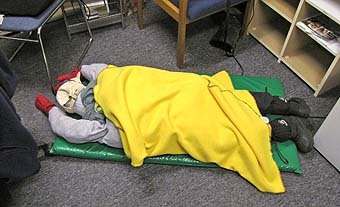 The following hilarious display called 'Hijacked Henry' was made by Mike Pewtherer. The display won at the Hawthorne Valley Fall Festival in Harlemville, New York in 2009! Mike Pewtherer's prize winning display with poor Henry being carried off by a huge black crow. Stephen DeFlorio of Sudbury, Massachusetts, USA, says that we all need to lighten up life! 'Crows are fun to make and explore!' 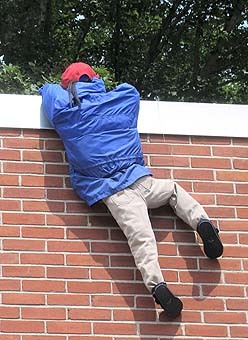 He has sent in the following photos of three delightful scarecrows that were not made for any scarecrow festival -- they just made his family and staff members laugh. 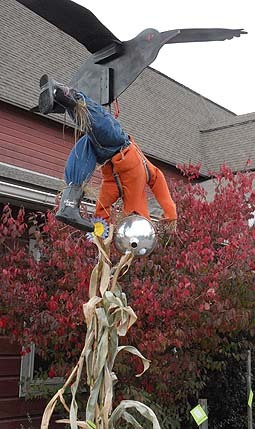 Photos of three funny scarecrows sent in by Stephen DeFlorio of Sudbury MA. Wouldn't they give your staff and visitors a laugh! 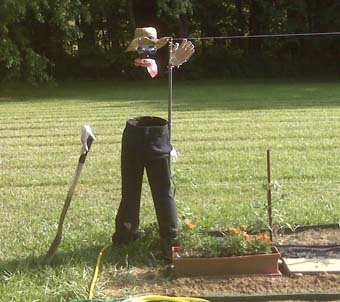 And here is a hilarious and very cleverly made 'Invisible Scarecrow' from North Carolina. Such an imaginative and funny idea! 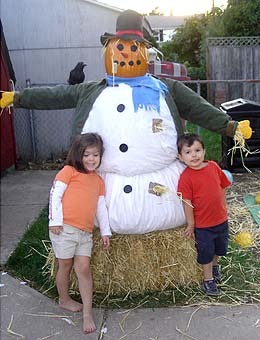 Frosty the Snow-crow, made by the Franciscus Family for the Hummelstown Scarecrow Contest in Hummelstown, PA. This beautifully-made scarecrow won First Prize! 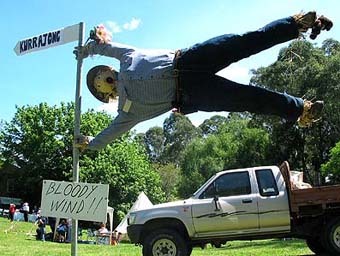 Note: This page includes funny scarecrow ideas for you and your kids to make.